Central to the planning support system is the use of GIS. The Ministry, with responsibility for local government in Jamaica, recognized the benefits of collecting and managing spatial and aspatial data to support communication, produce maps, handle approval processes, and model outputs in order to suggest alternate options for further development. 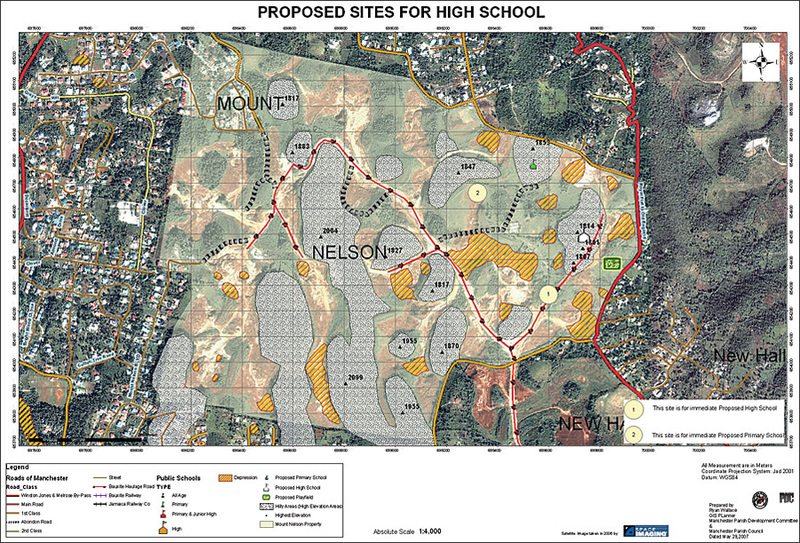 Map of proposed site to build a new secondary school for the Ministry of Education, using site selection criteria. Initial attempts to implement the use of GIS and related technologies in local government started with a top-down approach directed from the central Ministry in Kingston. The planning units within each local government body were identified as the drivers for implementation within the Parish Councils. Lorna Perkins, former director of urban planning and development in the former Ministry of Local Government and Environment, noted that the Ministry's overall objective was to ensure that all 14 local authorities, including the Parish Council and the Portmore Municipality, had a functioning and efficient GIS to support sustainable development planning. The GIS would support the preparation of development plans, which in turn would strengthen the development approval process in terms of reducing processing times. The data generated and managed would be shared across departments, such as building and revenue enhancement, to enable officers to make informed land-related decisions. The road toward achieving the objective was very steep and interspersed with numerous potholes and roadblocks. Perkins noted that changing the culture and increasing awareness of the use and benefits of GIS were the most resilient challenges. GIS was seen as a new phenomenon, and efforts to provide training were resisted by all levels in the organization. To address this required employing innovative communication techniques and negotiation skills. These ranged from one-on-one discussions and targeted focus group meetings with various stakeholder groups (building inspectors, parish councillors, secretary managers, planners, and the political directorate) to seizing opportunities at meetings and workshops to deliver clear, comprehensive, and example-driven presentations. Another major challenge was convincing senior management that allocating sufficient funds for GIS implementation had a direct impact on the work of the local authorities in areas such as road improvement and gully cleaning. These were activities that were given high priority and funding. Over time, with consistent workshops, seminars, and the use of practical case studies that showed how GIS could assist the Councils to deliver the services required by clients, the Ministry's management bought into GIS. Through an Inter-American Development Bank-funded projectParish Infrastructure Development Program (PIDP)GIS software and hardware were procured for all local government offices. Regrettably, this was done without a comprehensive implementation plan, requirements study, system design, human resources, training, etc. This approach failed to achieve the desired objective, as the "cart was put before the horse," in addition to the fact that the Ministry and Councils did not have the human resources required to undertake the work required. With the recruitment of directors of planning in all local authorities, another attempt from the Ministry level was made to have GIS implemented within the Parish Councils. The process started with the preparation of two reports, one that detailed an inventory/needs assessment of the Ministry, its agencies, and local authorities, and the other a systems and application design report. These documents provided the ammunition needed to roll out an enterprise GIS across the Ministry, the Parish Councils, and agencies. The required funding and "champion" at the top level are now needed to undertake the enterprise-wide implementation initially envisioned. What has been described in the preceding paragraphs is a top-down GIS implementation initiative. The major achievement of this approach was raising awareness of the benefits and use of GIS in local government. A corollary to this has been the spinoff effects on the local authorities, particularly the Manchester Parish Council (MPC). 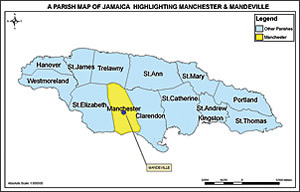 As described in the Manchester Parish Profile 2004, "The parish of Manchester lies in central-south Jamaica. Its capital, Mandeville, is 62 miles from Kingston and 72 miles from Montego Bay. The economy of the parish is based on bauxite mining, small-scale farming, miscellaneous manufacturing and agro-processing industries and provision of a range of services to central Jamaica. Manchester is a center of tertiary education, a growth industry and Mandeville in particular is becoming known as a university town. Community, heritage and nature tourism are also growing in importance. Predominantly a high limestone plateau with little surface drainage, the parish possesses a wealth of natural resources. Features include mountains which reach as high as 3,200 feet, over one hundred documented caves, extensive forests, lush parkland and a unique coastal ecosystem with rivers, wetlands, and extremely dry vegetation, that is to be managed as a protected area." 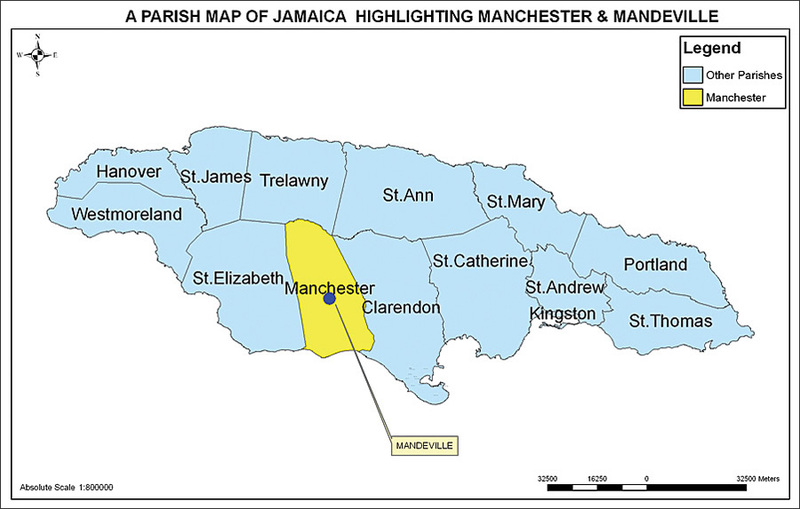 Location map of the parish of Manchester and the capital Mandeville. The Parish is growing at an unprecedented rate with the continuing spread of new houses across the hillsides, an increasing population, and all the challenges associated with uncontrolled urban development. The need to prepare development plans and to improve the delivery of services provided by the Parish, coupled with the GIS awareness and initiative programs from the central Ministry, gave MPC an added thrust to implement and integrate GIS and GPS technologies in its operations. After seven years, MPC's GIS operations have had a significant impact on a number of MPC business processes and on the lives of the people of the Parish. Data and maps are currently made available to the Planning and Road and Works Departments to facilitate the internal evaluation of development approvals pertaining to building, planning, and subdivision applications. The monitoring and enforcement of regulations have been improved; information/evidence can be made readily available to prepare comprehensive breach reports and stop orders. A significant impact has been the reduction in response time to natural disasters. The Council now has databases that enable the generation and identification of possible evacuation routes for communities marooned by flooding, models to identify and select sites to build high schools in the Parish, the analysis of housing distribution to understand settlement patterns, and the identification of ecosensitive areas that can be declared as protected areas. What were the key factors that contributed to the successes and achievement of the MPC? Sean Rowe, director of planning at the MPC with responsibility for GIS, identified three key factors: dedicated staff, partnerships with stakeholders that shared similar goals and interests, and continuous funding from local and international bodies. Given additional interviews and analysis of the work done to date, it seems that critical to the development and sustainability of the GIS operations at the MPC (this is generally applicable for most GIS implementations) are the partnerships and collaborative arrangements that have been established and, most significantly, the leadership provided by the senior management of the Parish Council and the Manchester Parish Development Committee (MPDC). Parish Development Committees, with membership from the private sector and community groups, were established as advisors to all local authorities to promote the delivery of more efficient services. Notably, the MPDC has been the most productive and successful. This success is attributed to the leadership and dedication of the private-sector partners and the shared vision and strong working relationship that was forged and maintained with the MPC. Other local authorities have not been able to achieve the successes that the MPC has. The local authorities all have similar organizational structures; all have Parish Development Committees, are provided with a similar level of financial resources from the central government, and have been given the same GIS training and awareness opportunities. The defining factors have been dynamic leadership, a shared vision, the exceptional initiative of the implementation team, strong partnerships, volunteerism, youth engagement, and buy-in from the stakeholders. Manchester's work to date has been far reaching. Its operational framework and the local sustainable development planning process are currently being looked at as a model for other Parishes/local authorities to follow and to be emulated across the Caribbean. Cecille Blake, BA, MSc, is the senior director/national GIS coordinator in the Spatial Data Management Division in the Office of the Prime Minister, Jamaica. She has been working in the field for the past 17 years and manages Jamaica's National Spatial Data Infrastructure program and coordinates the work of the Land Information Council of Jamaica (www.licj.org.jm). For more information, contact Cecille Blake, national GIS coordinator, Office of the Prime Minister, Spatial Data Management Division, Land Information Council of Jamaica (e-mail: csblake@moa.gov.jm; tel. : 876-977-0233, ext. 2234).